Fluvial Terra features paper and installation work by Megan Singleton that was inspired by her travel west from Missouri to Oklahoma. Singleton utilizes locally foraged soil and plant fibers to create artistic interpretations of the landscape and vegetation found in Oklahoma. Material and scholarly research is a critical component in Singleton’s practice. She considers her method of collecting, testing and transforming the plants to be a way of honoring them as living organisms while also engaging and educating the viewers about the importance of species awareness. For this body of work, Singleton selected crossover plants that have been designated ‘problem species’ and ‘invasive species’ by state government agencies in Oklahoma and Missouri. Through her work, she invites the viewer to connect to the growing, living environment, seeking to inspire them to foster growth and revitalization of our landscapes and their natural systems. Accompanying Fluvial Terra will be three pieces by renowned artist Kiki Smith, who Singleton tributes as an influence on her work, displayed in our Library. [Artspace] is proud to partner with OSU and 21c Oklahoma City on this exhibition. A continuation of Singleton’s installation will be on view in the 2nd floor gallery at 21c Museum Hotel as part of their Elevate program. They will also be hosting a performance of choreographer and dancer Wendy Jehlen’s Unfamiliar Butterfly. Jehlen’s performance at 21c Museum Hotel is in conjunction with the performance of her OSU performance of Lilith, which was inspired by Kiki Smith’s 1994 artwork of the same name. The illustrations used within the Altered Classics series are primarily engravings. The idea of cutting and repositioning the subjects of these prints profoundly changes the way they are viewed. Berry is interested in the transformative quality of creating sculpture out of a traditional two-dimensional object. Her altered books are created with a laborious technical precision that is apparent when observing the detailed sculptures on display. The material for Altered Classics has been sourced from the illustrations of Gustav Dore, which Berry collected from several classic works such as The Divine Comedy trilogy by Dante Alighieri, The Rime of the Ancient Mariner by Samuel Coleridge, and Jean de la Fontaine’s Fables. The sculpted books for this exhibition are displayed alongside several individual scenes, visually conveying the narrative within the novels they represent. "BEING A SCARRED WOMAN, I SEEM TO GRAVITATE TOWARD THE DAMAGED AND DISCARDED... NOW I SEARCH OUT THE ILLUSTRATED BOOKS HEADED TO THE WASTE BIN AND GIVE THEM A NEW WAY OF TELLING THEIR STORY. AFTER REPAIRING OR REBINDING, I CUT AWAY ALL BUT THE ILLUSTRATIONS. THE END RESULT IS BRINGING THE BOOK TO LIFE; TELLING THE STORY VISUALLY. I NEVER KNOW WHAT A SCULPTURE WILL LOOK LIKE WHEN I START. EACH BOOK SEEMS TO TRANSFORM ITSELF. I'VE HAD MANY PEOPLE ACCUSE ME OF DESTROYING A GOOD BOOK. BUT I BEG TO DIFFER. NO GOOD BOOK SHOULD GO TO WASTE. NO MATTER HOW SCARRED, IT STILL HAS A STORY TO TELL." We are proud to collaborate with Oklahoma State University museum of art and their exhibition Kiki Smith and Paper: The Body, the Muse, and the Spirit, by presenting a selection of Kiki Smith's work in our Library. 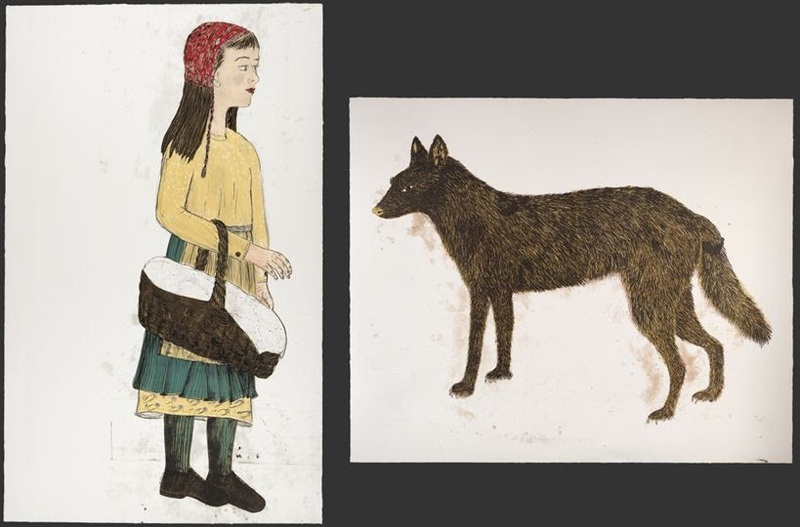 From OSU Museum of Art: Heralded as one of the most distinctive voices of her generation, Kiki Smith has been crafting captivating, challenging art for more than 35 years – from her early wax and plaster female figures to colorful wall-size tapestries of women and animals in nature. Birth, death, and regeneration are recurring themes – the human condition from its most vulnerable to its most enduring. Although Smith has ventured into an array of mediums, the one material she has most consistently engaged is paper, manipulating it for drawings, prints, and even sculpture. Both Fluvial Terra and Altered Classics directly and indirectly mirror the work of Smith. Both Smith and Singleton are drawn to hand-made paper as a medium for sculpting. They are experts in using this historic craft to create work in a contemporary concept. Singleton creates sculptures that transform invasive plant fibers into stunning installations where Smith uses paper sculptures to give a voice to the universal female. In addition, while Smith's work is highly conceptual and symbolic, Kelly Campbell Berry's work is straightforward and incredibly detailed, they are both interested in displaying the mystery of life as a complex and fragile condition. Both Smith and Berry borrow from common sources and combine them to forge storylines. Where Berry adheres to the traditional narrative of the books by choosing which illustrations to highlight, Smith creates new narratives that focus on a feminist rewriting of history.